This title in the Rapid Diagnosis in Ophthalmology Series presents a wealth of full-color images - along with differential diagnoses - in side-by-side page layouts to assist you in identifying a full range of disorders. A templated format expedites access to the guidance you need to diagnose the most common conditions related to the lens and glaucoma - from simple to complex - encountered in practice. Coverage of cutting-edge topics including electric shock cataract, intralenticular foreign body, hypotony maculopathy, ectopia lentis, and many more, help you keep your knowledge up to date. Hundreds of full-color images present conditions as they present in real life. Common diagnostic pitfalls discuss what to look out for when making a difficult diagnosis. A templated, color-coded layout and differential diagnosis boxes for each condition help you make quick, accurate clinical decisions. A focus on the most common conditions encountered in practice allows you to efficiently formulate treatment plans and referrals. 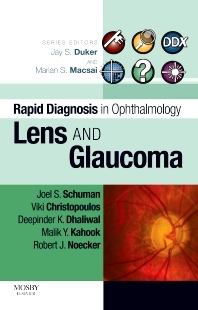 "This booklet is extremely helpful for students and ophthalmologists in training, and even for the experienced clinician who wants to refresh his knowledge, because a lot of relevant information on the area of lens and glaucoma is transferred by very concentrated text and fine illustrations"